NewsRob now sports an action bar that is more in line with what meanwhile seems to be the standard way on Android. It mimics the visual appearance and functionality of the Twitter app's action bar. 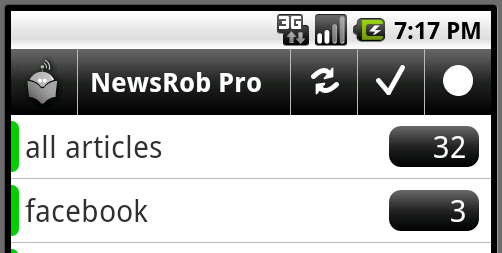 Tapping on the NewsRob logo always brings you back to the Dashboard (the home screen). Tapping on the title will give you some contextual information: On the article list it is the chosen feed, on the feed list it is the chosen label and on the dashboard a tap will reveal the last time a sync has run. Tapping on the refresh icon will trigger a sync as before, but with a twist. The sync icon will turn into a circular progress indicator. Tapping it will reveal a detailed progress indicator. Tapping it again will hide it. You can also interrupt a running sync by tapping on the "Stop" button. This functionality replaces the sync-in-progress notification from before and so hopefully this will be the end of some devices randomly rebooting during sync. Tapping on the check mark will mark all articles of the current view as read. Depending on your settings a confirmation dialog will be shown first. Tapping on the circular button will toggle between show / hide read articles. Not depicted above, but available on the article list, is an arrow up / down icon. Tapping it will toggle the sort order "newest first" and "oldest first". In line with the Android standards the action bar is on the top. In the settings however, you can set the location of the action bar to the bottom or disable it completely. For Android 1.5 devices and for devices with small screens (Xperia X10 mini, HTC Tattoo & Wildfire) the action bar is always disabled. With this release usage data collection is re-introduced. There is a dialog in NewsRob that will explain this to you in more detail and asks you for to explicitly allow this usage data collection. Without this permission no data will be collected. Thanks to Roman Nurik for giving me some great recommendations regarding NewsRob's UI. Some of the results you will see in this release, e.g. more spacious article list, and some in the releases to come. Hi Mariano, any chance of send full article by email coming soon? I have the pro version but am willing to pay more money for such a feature. The action bar options are disabled for me. I'm using htc wildfire, original ROM. There are some comments in Spanish saying the same. Right now I have no action bar. "For Android 1.5 devices and for devices with small screens (Xperia X10 mini, HTC Tattoo & Wildfire) the action bar is always disabled." Eh? There's no option to enable it on a Tattoo? I liked the sync and mark read buttons in the previous version -- it would be sad if that were gone..
A couple of ideas on teegee comment. From my point of view, newsrob is not a 4.5 version, but a 3.0, since I lost many of the features I used. We are talking about an app that deals, basically, with text. So, I don't think that a QVGA screen lacks anything needed. I'm not an experienced programmer, I'm not a programmer actually, but, I'd like to have a solution. I don't like that much the Google Reader app, yet. Right now I'm giving it a try, but I really like the way newsrob shows the posts before you read them. I'd love to keep using newsrob, but the way I used it is no longer available. I thought about a larger redesign of sharing and wanted to implement it as part of that. However I could also only implement the sending of the full body only. But even then it would not be in the next release. Maybe in the January release. But this is no promise and depends on many factors. Teegee/Indispuesto, there was a friendly message with the same content on the mailing list. I will need to think about it a little more, but will answer it there over the weekend. ok? Mariano. Thanks for the understanding. Another bug, that I guess you are aware. When I open a post, depending on I don't know what, the ad space that appears on the post list remains black. I mean, the post does not cover the whole screen. There's a black strip at the bottom of the screen. Seems to be random. If it happens, I close the "window" and I open a new post and, usually, the black strip disapears. If I don't and I keep reading new posts, the strip remains. No, I actually wasn't aware of that. I have ads enabled in my pro version to see such things, but I haven't. Maybe it's an issue with the form factor. Do you see this once an hour, once a day or once a week? The ad space on the post list? You mean on the article detail view or on the article list? From a purely aesthetic point of. View, I HAAAATE the loss of the greyscale. The black bars are insanely contrasty and unattractive, and just less subtle and elegant. It also makes it much more ovbious to others what's going on in the screen. Anyway to at least have the optioon of grey instead of black? Please also check for the black bar. what theme are you using? The light or dark one? What do you mean with that others can now see what you do on the screen? There will be more themes in the future, but as I only have limited time it will take some time until I get round to it. On the article list there is an space for ads. That space remains black quite often on the article itself. Often means once or twice a day. A possible reason may be when you tab on an article. I think that if you go quite fast opening the app and the post it is more likely that the black space appear, but it is only a guess. What about the New version I linked to above? Black strips are gone? I installed the beta for small screens on my Wildfire and really like it. I really really want to have the grey theme back... AND what I don't like also: the news action bar. Yes, I hate UI changes for apps that I regularly use, but the new buttons are so small that Newsrob has become annoyingly painful to use. Andre, when I implemented the original tool bar I was on my own and implemented what I considered was best. Now that we have an official way of doing things (Twitter app) I stick with that, even though I see some drawbacks, as you mentioned, with that approach. I think that's the right way to go and it seems that most users agree. But just as an intellectual exercise, if I weren't I couldn't just add the old way as an option. It was hard enough to implement this action bar, as Android doesn't provide any standard components for that and making it configurable took its toll too. So this new action bar is here to stay, you can just disable it. Regarding theming. The world keeps turning and the colors will change over time again and I also want to provide more than the two themes we have now, but it takes time and other stuff seems more important to the majority of users at the moment. Mirko, thanks. I appreciate the feedback. How can I revert back to the previous version then? I cannot stand the new black look and miss the grey. But worst of all, the tiny little buttons on the new action bar. Feed name is useless...its in every article. Home button also not needed because on mark all read, it goes right back to feed list...which I love!!! It seems quicker too, so ideally it would be nice to have this version, but with the old grey theme instead of this flashy flash black and of course the big huge 3 button toolbar. Please also check for the black bar." That version is totally fine for me.. The buttons are small, but that doesn't bother me much. The good thing also is that I can see the detailed update status again.. I haven't seen any black bar problem so far (tattoo, android 2.2.1, newrob pro). The, I haven't uploaded the new version to AndAppStore. And even if I will do so, now that I know that you (and others) like the old version better, I'll leave 4.4.2 up there too. I can't do that on the Android Market. I just disabled the action bar and saw that I can mark the articles with the Menu-Button again. That is great. That helps me using V4.5. Quick question, i have the pro version and with the latest update from the market i`m getting ads. Is this supposed to happen? Okay, the newest update from the Blog fixed it all. Good work, but in this case I am not completely happy: why did you take off the Sync Progress in the Notification Area? In my case is very useful because I only synchronize NewsR when I am home or at work, so this is something I usually do in background, and it is very helpful for me to have this info in the notification area. Is not possible to keep both options? jhuesos, because it was causing reboots on some devices, e.g. HTC Desire. You can still have the notification when you enable this in the settings, but there will be no live updates in the notification. However if you tap on the notification it will take you into NewsRob with the sync progress open. It is possible, but too much work to maintain. OK, I understand but I am not happy with it. Unless you could put it as an option in EXPERIMENTAL or something like that. Valiks, I don't know what that means. If you could please describe it in more sentences, then add it here: http://newsrob.uservoice.com. Im using the free version of newsrob and i have a delay problem with it on the Galaxy S. When trying to open newsrob, it goed fast but when really read an article, it take long time to open. Times are like 20-60 seconds. Also when you are in the article and wand to go to the next one it take sometime also that long. I have firmware v2.2 on the Galaxy S.
Hope there is anything to do about it, cause i love the app. The whole Galaxy S situation is a very unfortunate situation, but I don't think that there is a solution for non-rooted phones and even the anti-lag fix for the rooted phones are IMHO only a bit of ductape. If you have more to add, please come to the group: http://bit.ly/nr_list. I personally have no experience with Galaxy S based phones, but other NewsRob users have.